Also known as Common ginger, Canton ginger. Culitivated mostly in West Indies, parts of Africa and Asia. The roots (rhizones) are the parts used in herbal remedies but the young tender shoots are also edible. 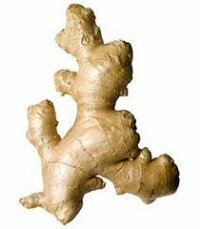 Ginger is widley used in cooking all over the world, both in savoury and sweet dishes. 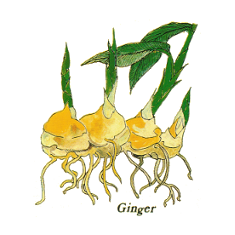 Ginger root is effective in the prevention and control of nausea, including travel sickness, morning sickness and also siad to help with the effects of nausea after chemotherapy. Also useful for easing the symptoms of coughs, cold and flu. From the 1580s, Jamiacan ginger was the first oriental type spice to be grown in the new world and then imported back to Europe. In the middle ages the value of one pound weight of ginger was nearly the same as the value ofone sheep.